I'm extremely happy with the way my merguez sausage turned out, but my mind keeps wandering to think up new ways to season a lamb sausage. I think because lamb has such an inherently distinct flavor, it requires a bit more selective seasoning than a meat like pork or chicken. I've been toying with some classic lamb accompaniments, such as rosemary, olives, anchovies, and curry. Then it hit me, why not go with something classic and Greek, such as feta, garlic, and fresh oregano? Building off this idea, one of my favorite sausages to make is a pork sausage stuffed with cubes of cheese. This works well, because the pork casings are so large there's plenty of room for both the meat and cubes of cheese. But lamb casings, being so small in diameter, wouldn't give me that advantage. But feta is so intense in flavor, and crumbles so easily, it could deliver a lot of flavor in a small bite. 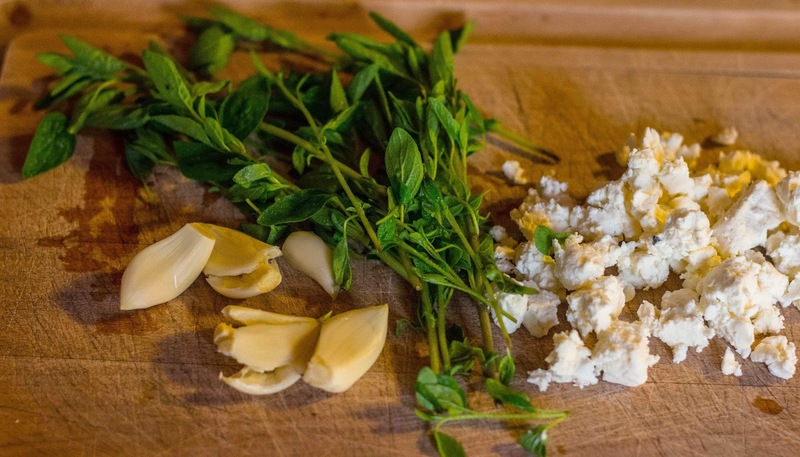 Garlic and oregano would support both the strong notes of lamb and the briny, oily taste of feta. I've said it before, but I love working with lamb casings. They fill quickly, evenly, and give a wonderful snap! when you bite into them. 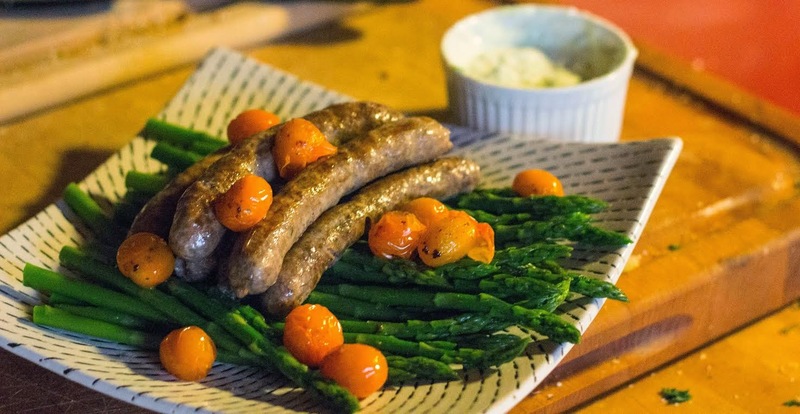 To play off the springtime nature of this meal, I served the lamb sausage with blanched asparagus, tiny sauteed grape tomatoes, and a creamy tzatziki yogurt sauce. Being such a classic pairing, I suppose I shouldn't be surprised that the feta and oregano worked well in a sausage. I mean, people have only been eating them together for centuries. But still, I'm proud this turned out as well as it did. The fresh oregano actually stood out more than I thought it would, while the strong, salty flavor of the feta was more of a backing flavor. I could have gone for a more pronounced feta flavor, but I do worry it would be easy to go overboard with too much. I think in the future, I may keep the feta quantity the same, but just garnish the top of the dish with extra feta as desired. 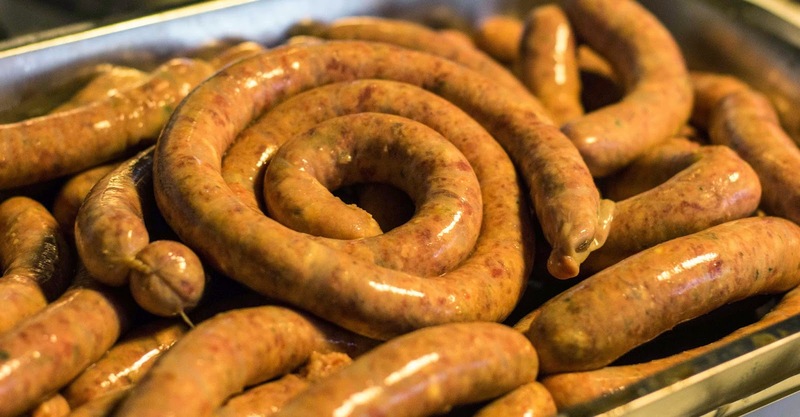 That way, I'm not saddled with five pounds of sausage that tastes only of lamb and feta.